While the GC32 Racing Tour for 2015 has been unveiled with a program of five events taking place across Europe next summer, focus before then shifts to Florida where four of the one design foiling catamarans will be training in Miami before heading south for Quantum Key West Race Week. Using the event as a demonstration for the class in the USA, four GC32s are entered in Quantum Key West Race Week. Taking place over 18-23rd January, this is the northern hemisphere’s first major regatta of the year, sailed in the azure blue waters off the so-called ‘Conch Republic’, perched on the southernmost tip of the Florida Keys. The four will include two of the longest-standing GC32 teams: Team Spax Solutions of GC32 Founder Laurent Lenne, and Armin Strom Sailing Team, skippered by Swiss former Olympic Star sailor Flavio Marazzi. However it will be the first competitive outing in the GC32 for French skipper Erik Maris and Zoulou and for New Yorker Jason Carroll’s ARGO team. Fresh from his second consecutive victory at the Melges 32 World Championship in Miami last week, Carroll says that he became interested in the GC32 after sailing a foiling Moth, while he is already familiar with catamarans having raced his Gunboat 62 Elvis at events in the Caribbean (Elvis otherwise is used as the ARGO team’s mothership at regattas). 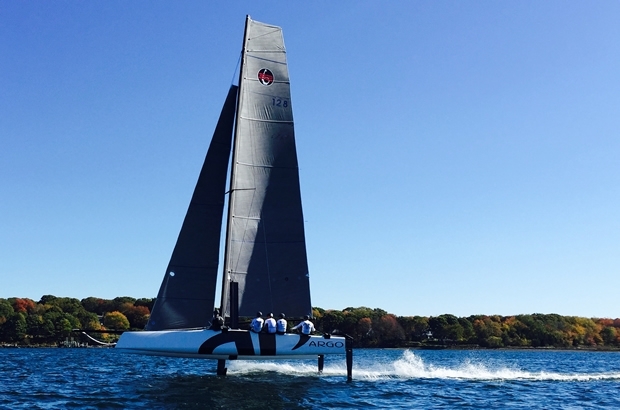 Since acquiring their own GC32 the ARGO team has been training aboard her in Newport and Miami. “Sailing it has been a thrill - it can scare you, but it can certainly put a big smile on your face,” says Carroll. During training in Newport in October, ARGO made an attempt on the Mount Gay Rum Around Jamestown Record. Setting new time of 58 minutes and 31 seconds for the 21 mile course, they took 4 minutes and 7 seconds off the previous time. On the attempt the breeze was between 20 and 30 knots and they touched a top speed of 37.1 knots. In addition to Carroll and Corning, sailing on board the ARGO GC32 will be Moth sailor Anthony Kotoun, Mike Kuscher - both regulars on the World Championship-winning ARGO Melges 32 - plus Dutch catamaran specialist Mischa Heemskerk, who campaigned the Magic Marine GC32 at Marseille One Design in September. As to the advent of GC32 competition as his regatta, Peter Craig, President of Quantum Key West Race Week’s organisers, Premier Racing, commented: "We are really pleased to have the GC32 class at the 2015 edition of Quantum Key West Race Week. While multihull racing is not new to Key West, foiling cats are and they will certainly add an element of excitement. We'll do our homework with VPPs as we do every year to keep the classes on Division 1 apart at the corners."